NFL ticket sales and TV viewership numbers are being affected by the Constitutional rights of their players to kneel or sit for the National Anthem in unity as a sign of protest towards racial inequality and police brutality but the data according to brokers indicate it is not much, if at all. Ticket revenue while significant is not the lifeblood of the $14 billion business rather it is the billions of dollars paid for television from ESPN, NBC, CBS, and Fox, and now you can throw in Amazon Prime video online streaming during Thursday Night Football. The Sports Techie community blog is a firm supporter of this issue. I took a knee yesterday with my son at his school during the playing of the National Anthem and was told by the Principal that the school district has stated that as long as it does not negatively affect the classroom they are OK with the symbolism because it is my right as a United State citizen. In the red state of Georgia and the blue town of Atlanta, it feels good to know educators are respecting individual rights rather than get caught up in the rhetoric of opposing views. San Francisco 49ers kneel during the National Anthem before a game against Washington at FedEx Field on October 15, 2017 in Landover, Maryland. Betting on football is a another right in certain countries around the world and in Las Vegas here in America, as is waging on props bets whether and when President Trump will finally make his impeachable offense. If that were to happen today, Vice President Pence is not much better of a Presidential fill-in. During week five of the NFL season he spent more than $250,000 to fly to a Indianapolis Colts versus S.F. 49ers game only to leave after 20 players predictably and to no ones surprise, took as knee which was appropriately satired by Saturday Night Live. What began with a single person in Colin Kaepernick who just filed a grievance for collusion against the NFL and included Trump as a significant reason why he has been supposedly been banned from signing with a team as a free agent by all 32 owners, has cascaded to hundreds of players across professional, college and youth football, in addition to the German National soccer team and thousands of like-minded citizens in our free country. President Trump tweeted that TV ratings where plummeting because of the controversy yet the metrics uncovered is not conclusive. The numbers provided by TickPick and SeatGeek via USA Today show ticketing is on par with the last 3 years. Perhaps what this really means though is fans are actually attending games while watching on HD TV’s and digital devices as they root on their favorite team, tailgate at stadiums across the nation and play fantasy sports even if scores of fans choose not too. Will the NFL owners led by Commissioner Goodell prohibit the protected Bill of Rights at the owners and players meetings in New York by banning this important social cause during pre-game festivities? If protesting continues to affect ticket sales in a negative fashion they might but all signs are this is not the case. The bigger picture is whether the ratings will plummet but this is also not the case when looking at viewership data from the Super Bowl champions New England Patriots defeat of the Tampa Bay Bucs which pulled in a rating of 5.0/19, a total viewership of 15.43 million with Amazon Prime Video claiming an average of 391,000 viewers. TickPick CEO Brett Goldberg and director of client relations Jack Slingland told USA Today, the way the “NFL, the owners, the teams and the players handled last week’s games will reduce the volatility that we have seen in ticket sales.” As a result, they got a 9.6% increase in sales week 5 compared to week 4. SeatGeek claims buying habits have stayed relatively the same and that ticket prices over a two week period were steady. Sales data mined by the secondary ticket company show an equal number of weekly transactions. Yet, Sporting News says average game attendance is 18% percent less after 5 weeks than the same time period two seasons ago indicating the jury is still out whether this is a short-term or long-term trend. Where this hits the owners the most though is viewership numbers because the average TV audience through Week 5 fell 7% compared to 2015, derived by Sporting News from Nielsen data. These billionaires and the sport will survive this hiccup. 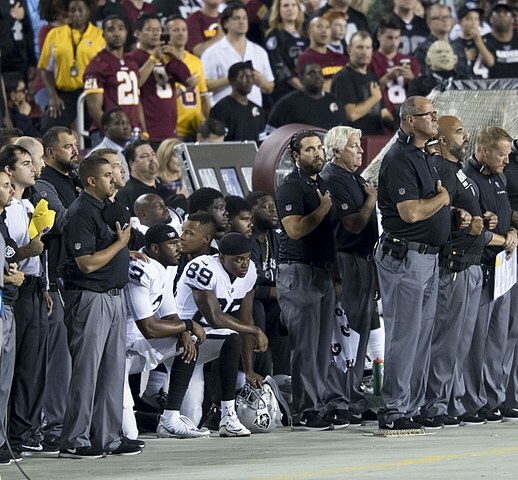 Oakland Raiders players at Washington take a knee in protest on September 24, 2017. Sports Techie, this polarizing issue has become a dagger in the side of the NFL owners who care more about the bottom line and worrying about protecting the shield and brand instead of the players freedom, when without them, the league itself would tank. Jerry Jones pulled a 180 degree public about face when he threatened to bench, not cut, any Dallas Cowboys player that failed to stand for the anthem after the bye week when he in fact had already taken a knee with his team. Sports Illustrated listed all the players that stood this past weekend. The NBA and Commissioner Silver believe they have cut off this behavior before opening night this evening. Something tells me they are dead wrong and the likes of LeBron James will somehow show his form of solidarity with the issues before the Cleveland Cavaliers take on the Boston Celtics, or perhaps All-Star Steph Curry will represent the cause, DubNation and the defending champs, the Golden State Warriors, when they play the Houston Rockets by taking a knee. In the end, walk the walk of the oppressed and realize the National Anthem take a knee protest is not intended to disrespect the flag, military or our country because that is indeed, fake news, you can bet on that being true.